So far I’m two for two since posting my midwinter blogging schedule. Today’s post is about another one of those recipes from Joanne Chang’s cookbook Flour, too that Chang attributes to one of the chefs running the savory side of her Flour Bakery-Cafes — in this case, Chef Corey (she never gives family names for some reason). He created this recipe for Flour’s tenth anniversary celebration, as part of a multi-course food-and-beer pairing, although no beer is called for in the cookbook. As someone who grew up in New England eating the fine products of the Burnham & Morrill Company of Portland, Maine, I have certain standards for baked beans, and I’m pleased to say that Chef Corey — a Mainer himself — has managed to exceed them: these beans taste absolutely wonderful, with a deep molasses flavor, just the right amount of porky goodness, and not too much else. If only it didn’t take three hours to make this recipe, I’d certainly do so more often. 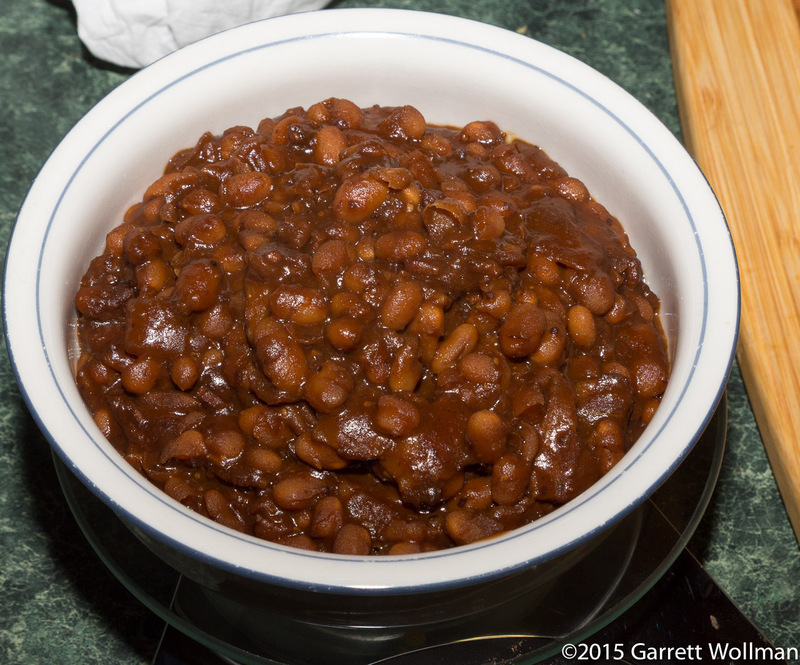 One surprising note: these “baked” beans aren’t actually baked — they are cooked on the stovetop, in a Dutch oven. (Or I suppose you could cook them by the fire in a Dutch oven, which is how they would originally have been prepared.) The preparation is quite simple (just time-consuming). 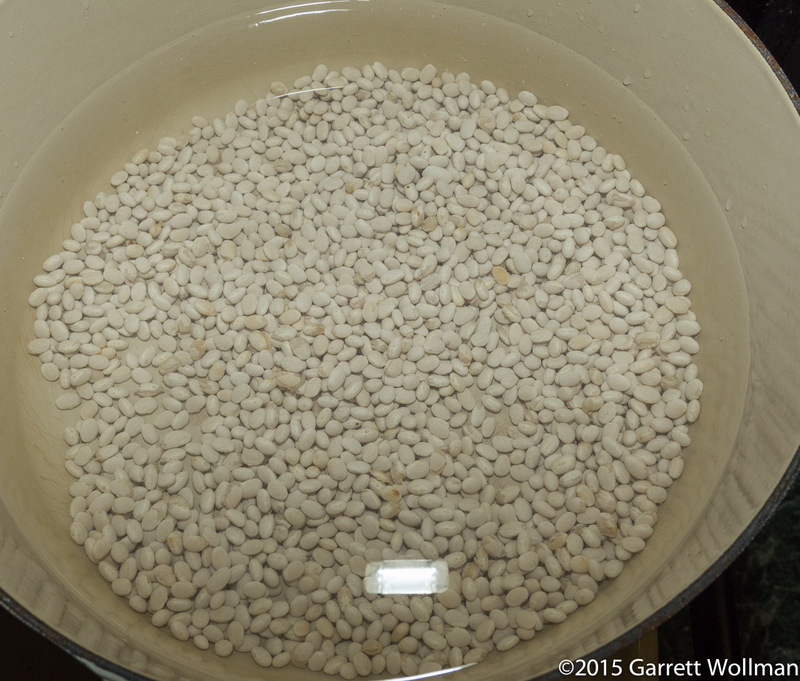 Any recipe for baked beans starts with dry beans — navy beans in this case, although other white beans could be used. Before doing anything else, it is necessary to pick over the beans, removing any that are discolored, cracked, broken, or otherwise unsuitable. It’s pretty rare with today’s manufacturing technology to find twigs or stones in your beans, but if you do, those obviously get tossed as well. These are the sort of defective beans that need to be removed. 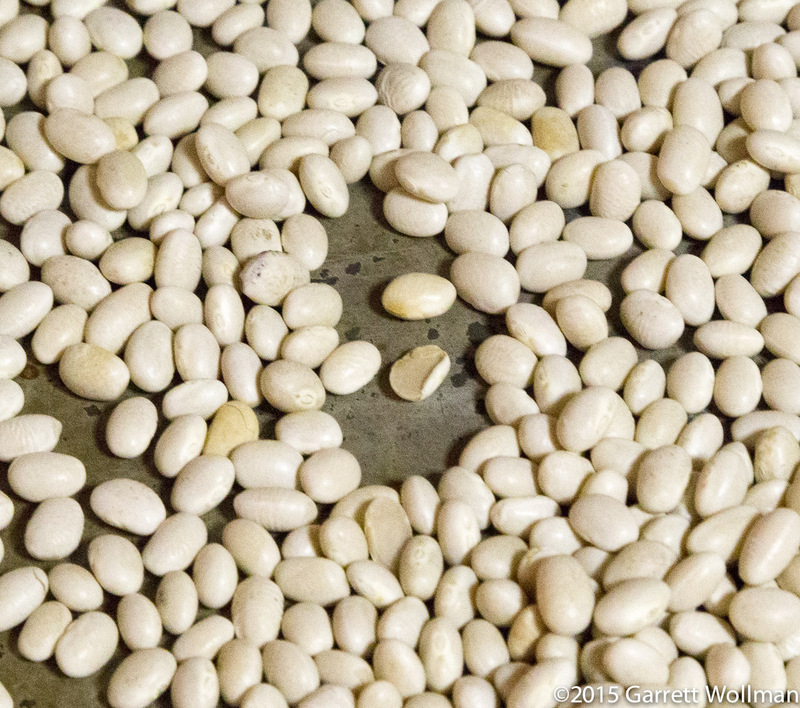 Once the beans are sorted, they can be weighed — this recipe calls for a pound — and then rinsed to remove the dust that accumulates in storage and processing. This recipe uses a modified “speed soak” procedure. Rather than soaking the dried beans in cold water for several hours to rehydrate them, they are instead cooked on a slow boil for an hour in the Dutch oven. Meanwhile, I can put together the other ingredients. So there’s one major thing missing from this picture — can you guess what it is? That’s right: BACON. I didn’t forget it, though — I just wanted to leave it in the refrigerator until I was actually ready for it, rather than letting it sit at room temperature on the counter. (I’ve also left out the water and the salt.) 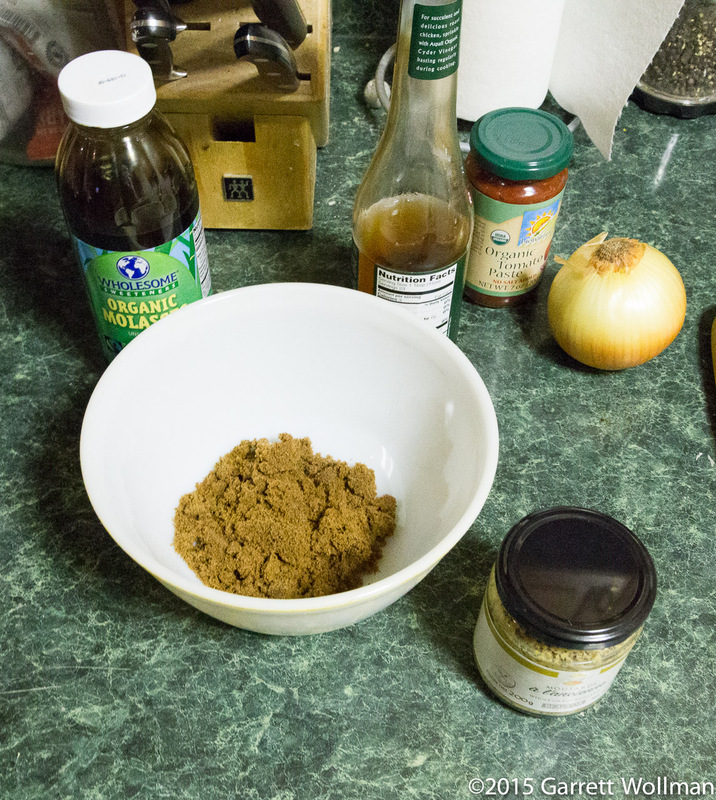 The other ingredients are an onion, molasses, brown sugar (I used dark muscovado), cider vinegar, whole-grain mustard, and tomato paste. Most of these ingredients are added at once, so I mixed them together in the bowl with the brown sugar, to give the sugar plenty of time to dissolve. After their hour-long hot bath, the beans are drained. They are already tender, but as yet unflavored, and they’ve given up a bit of starch to the cooking water, which is discarded. The beans have absorbed at least their weight again in water during the “speed soak” process. 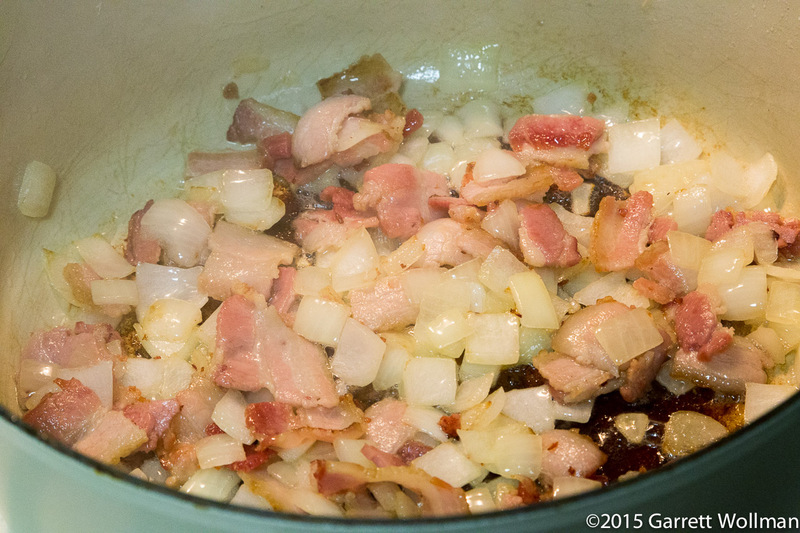 The onion, having been chopped in half-inch pieces, is sautéed in the rendered bacon fat — no other fat is used. The fond deepens. 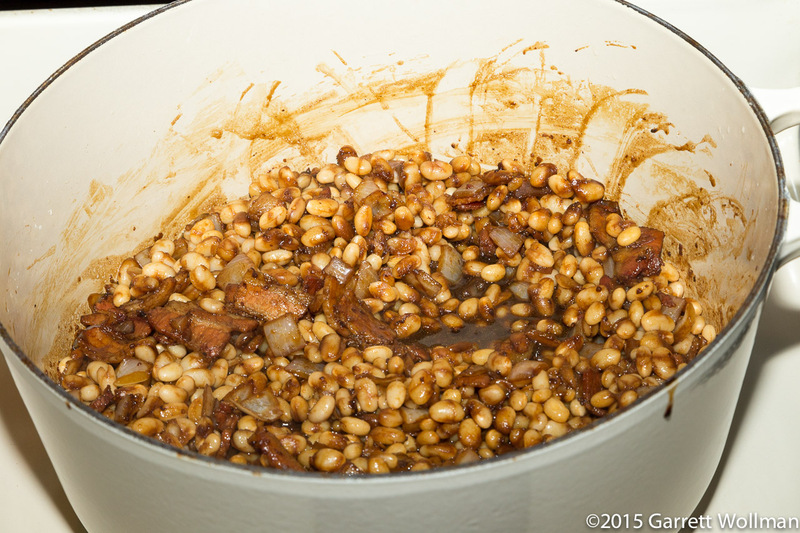 After the onions cook for a few minutes, the beans are added back to the pot, along with the other ingredients. The cider vinegar serves to deglaze the pan; I worked the bottom of the pot with a spatula to scrape up that lovely fond and redissolve it. The mixture is cooked for another half an hour, while the sauce thickens and the remaining liquid evaporates — then more liquid is added, in the form of some tomato paste and two cups of water, and the beans continue to be cooked over low heat for another hour, or until the desired consistency is reached. And there’s the final product. This recipe made exactly 56 ounces for me, so it was easy to divide it into four 14-ounce servings. Chang suggests serving with some additional crispy bacon crumbled on top; I expect that I will have two of my remaining servings accompanied by leftover pork sausages instead — like franks and beans but oh so much better! Note that this is a substantial meal on its own; by comparison, the serving size of B&M baked beans (traditional style) is listed as a half cup or 4¾ oz — so you should think like our ancestors did, that the beans are the meal and you’re having a small amount of meat as a side dish. 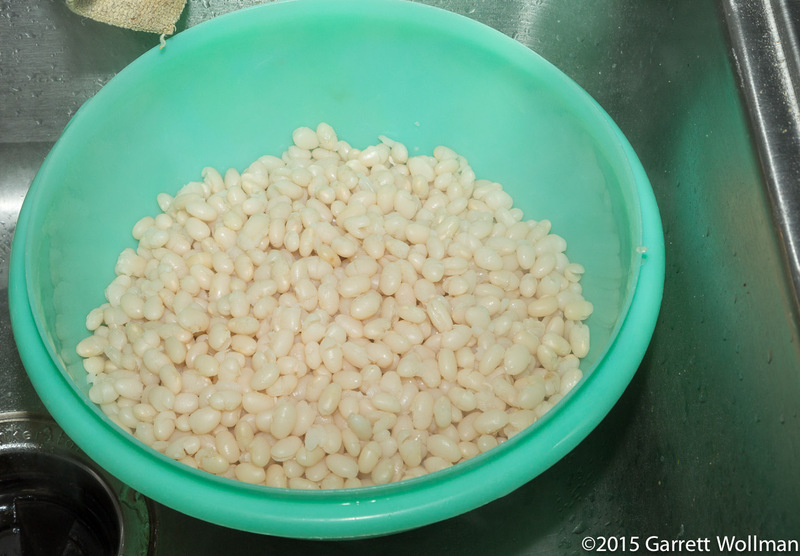 (If you did want to serve these beans as a side dish, you would get 12 servings of just under 5 oz each. Divide these numbers by three.) These numbers will vary in accordance with how lean or fatty your bacon is; I used Vermont Smoke & Cure brand, which is labeled as only 3.5 g total fat per rasher, and only 1 g of saturated fat. 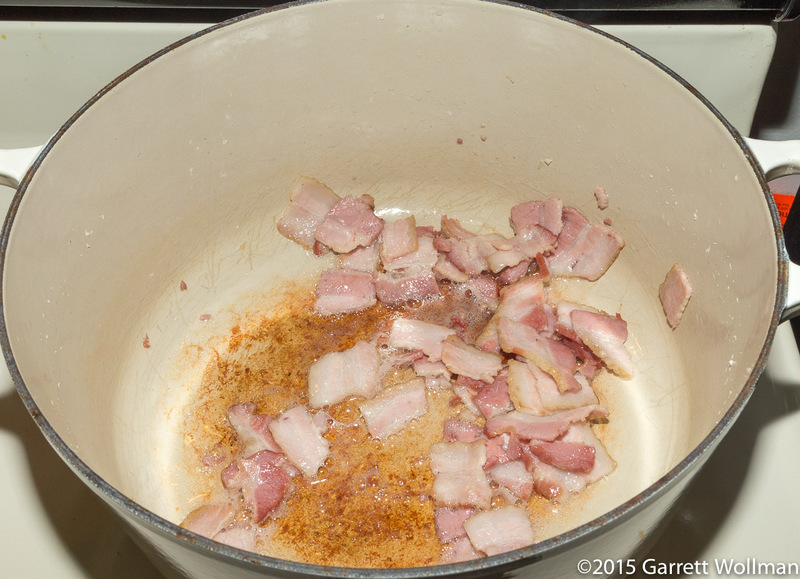 I ended up wanting a bit more salt in my batch, which is not reflected here — the salt you add will depend on how you like it and how salty your bacon is to start with. This calculation does not account for nutrients originally in the beans which were discarded with the soaking water (primarily minerals and carbohydrates). This entry was posted in Food and tagged bacon, baked beans, Joanne Chang, legumes, main dishes, recipe. Bookmark the permalink.